Bristol Borough municipal offices are located at 250 Pond Street, Bristol PA 19007; phone: 215-788-3828. Photo: Photographed by The Gombach Group © 1998, 2002. Bristol Historic District see text, below. Bristol Industrial Historic District circa 1875, 1936; was home of six factory complexes the largest of which were the Grundy Mill and the Bristol Carpet Mills. General Stores and Mold Loft Building sole survivor of the former WW I vintage Harriman Yard of the Merchant Shipbuilding Corporation. Grundy Mill Complex, circa 1876, 1935; William Hulme Grundy began in the woolen industry in Philadelphia and moved his operation to Bristol, where he had family ties, in 1876. Harriman Historic District was a residential housing development created to house workers for the Harriman Yard during WW I.
Jefferson Avenue School circa 1908, fieldstone and limestone-trimmed stone structure designed by the Philadelphia architectural firm of Heacock and Hokanson. Jefferson Land Association Historic District circa 1918; working mens' row homes; part of a real estate venture organized by prominent local businessmen, including Joseph R. Grundy. Portions of the content on this web page were adapted from a copy of the original nomination document that was submitted to the Department of the Interior, National Park Service in 1980. Adaptation copyright © 2006, The Gombach Group. Bristol dates from about 1681, when Samuel Clift established a ferry across the Delaware River at this location (Green 1911:20). A settlement, largely comprised of Quakers, soon grew up around Clift's ferry, and in 1697 the residents petitioned the Provincial Council to establish the community as a market town. The Council granted this petition, making Bristol the third town established in the province, following Chester and Philadelphia, and later that year Phineas Pemberton surveyed the town and laid out lots (Davis 1905:1:316-317). The community's original boundaries consisted of the Delaware River on the southeast, Walnut Street on the northeast, Pond Street on the northwest, and Mill Creek, presently buried beneath the municipal parking lot behind Mill Street, on the southwest (Green 1938:17). These boundaries encompass the southwestern portion of the Bristol Historic District. Bristol grew rapidly during the early part of the eighteenth century. The ferry, the market house, and the attendant agricultural fairs, attracted new settlers to the community. The establishment of a mill, the first in Bucks County, in 1701 spurred further growth, as did the provincial government's 1705 decision to establish a courthouse at Bristol (Battle 1985:386, 401; Green 1911:36). The court sat at Bristol from 1705 to 1725. By 1713 the town boasted both a Friends' Meetinghouse and a Protestant Episcopal Church. In 1720 Bristol incorporated as a borough, culminating this first period of the community's history (Green 1911:48-58). The only building surviving from Bristol's initial period of development is the Friends' Meetinghouse, located at the east corner of Market and Wood Streets. This brick building, though somewhat altered by the infilling of windows and the application of stucco, is a direct connection to the earliest period of the community's history. A "great fire" in 1724 apparently destroyed most of the town and accounts for the lack of other surviving settlement period buildings in the district. The meetinghouse probably received significant damage during this disaster, as records indicate that the building was partly taken down and rebuilt in 1728 (Davis 1905:1:317; Green 1911:48). Bristol recovered slowly from the fire of 1724. As late as 1756 only Mill Street was "marked by anything like a continuity of buildings" (Davis 1905:1:318). In 1784 the town contained only forty-five dwellings, and this number rose to only fifty by 1790 (Green 1911:61). The town's chief importance during the latter decades of the eighteenth century stemmed from its position as a ferry landing and, after 1753, as a way station on the stage line from New York to Philadelphia. The Delaware House, an imposing four-story stone and frame hotel, reflects Bristol's importance as a stage stop and ferry terminus. Located at the east corner of Mill and Radcliffe Streets, the Delaware House was strategically located adjacent to the ferry landing at the foot of Mill Street and directly on the stage route through town. The hotel, which was known as the George the Second when it opened in 1765, was built and operated by Charles Bessonet, a French immigrant who arrived in Bristol in 1730. Following the Revolution the hotel, which was known as one of the finest hotels between New York and Philadelphia, was renamed the Fountain House (Green 1938:70-75). Although the building has undergone numerous additions and alterations it maintains a significant degree of integrity and readily conveys a sense of Bristol's past history as a transportation center. Positive identification of late eighteenth and early nineteenth century residences in the district is difficult due to vague and contradictory documentary evidence. Nevertheless, several residences from this period have been tentatively identified. These buildings reflect the concentration of settlement along Mill Street during this period and the relatively modest appearance of residential buildings in the largely Quaker community. Mill Street, the principal commercial street in Bristol, remained heavily residential in character throughout the eighteenth and nineteenth centuries. Most of the eighteenth and early nineteenth century residences on Mill Street have been greatly altered over the years. Two residences, the former Pursell Drug Store (Mill Street) and a two and one-half story brick house on Mill Street, retain a significant degree of integrity and permit a glimpse of the character of Mill Street during this period. The former Pursell Drug Store was probably constructed about 1781 as a residence for Thomas Belford. Howard Pursell, a prominent local physician and druggist, operated a drug store out of the building from 1869 to 1927. The lineage of the house on Mill Street is much less certain. It clearly dates from the late eighteenth or early nineteenth century and most likely was constructed as a residence. Louis Hoguet's drugstore occupied the ground floor of the building throughout much of the nineteenth century. Other buildings from this period include the stone row, presently three, but originally six units, located on Wood Street, and the stone and brick double house on Market Street. Between the 1780s and the 1820s Bristol became known as the premier spa in the United States. The nation's elite flocked to Bristol in order to take the waters of nearby Bath Springs. The presence of the springs, and Philadelphia's tenure as the nation's capitol prior to 1800, attracted a number of wealthy residents to Bristol. These new residents settled along Radcliffe Street, overlooking the Delaware River, and quickly made the street into the town's most prestigious residential address. Several grand residences constructed during this period survive, perhaps the most significant being the Greek Revival temple constructed in 1818 as a home for Philadelphia merchant Joseph Craig (250 Radcliffe Street). This building, altered and enlarged on several occasions, most notably by the Philadelphia architectural firm of Heacock & Hokanson in 1927, has served as a bank since 1833. While Bristol's position as the nation's premier spa certainly attracted wealthy residents and high-style architecture to the community, the town's economic prosperity during the first half of the nineteenth century depended upon its position as a transportation center. The town's shipbuilding industry, which commanded widespread respect, accounted for a significant portion of this prosperity. Shipyards operated on Mill Creek, at the southwestern edge of the district and along the banks of the Delaware northeast of the present Franklin Street. The shipwrights constructed a number of residences in town, few of which may be positively identified today (Green 1911:103-104). 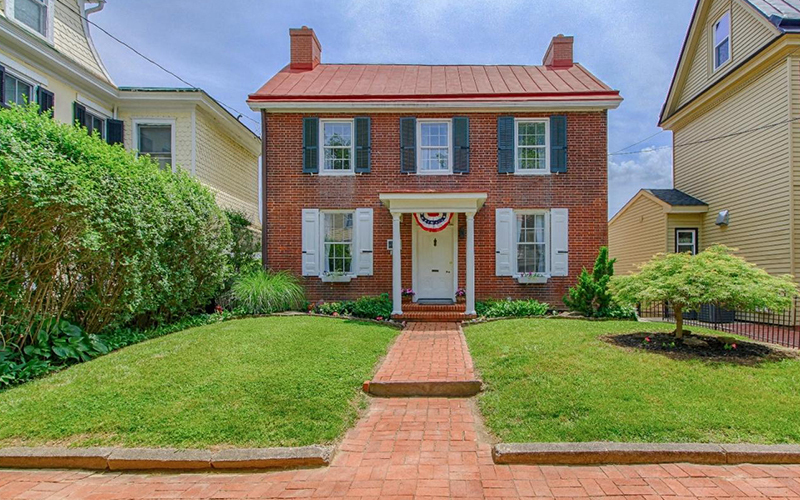 The John Reed House (921 Radcliffe Street), a handsome two and one-half story brick house constructed in 1816 by one of the town's most prominent shipbuilders as his own residence, is an exception to this rule and an excellent example of the work of these craftsmen. A Victorian-era addition to the southeast end of the house and a porch constructed during the same period do not obscure the original character and integrity of the building (Green 1938:190-197). Shipbuilding remained an important local industry well into the mid-nineteenth century, however the impetus for Bristol's greatest period of growth, which occurred between 1825 and 1855 stemmed from the town's position as the southern terminus of the Delaware Division of the Pennsylvania Canal. Begun in 1827, and completed in late 1830, the canal connected Bristol to the rich anthracite coal fields of northeastern Pennsylvania and transformed Bristol into a bustling transportation hub (Davis 1905:1:325; Green 1911:144-48 Battle 1985:409). The need to transfer goods to and from the canal boats at Bristol created a local real estate boom in the 1830s and 1840s. The demand for riverfront property, suitable for the construction of wharves, docks, or warehouses soared. In 1836 Franklin and Penn Streets were opened to the banks of the Delaware in order to provide access to the newly built docks and wharves (Battle 1985:409). The prosperity that resulted from the presence of the canal brought the railroad to Bristol. In 1834 the town's first railroad depot opened at the foot of Market Street, in close proximity to the wharves (Green 1911:150). The canal brought both new residents and buildings to Bristol. The wealthy and prominent built their houses along Radcliffe Street, the community's traditional upper class address, while longshoremen and other workers lived in modest frame rows constructed in the northern portions of the original town and on new streets carved out of the farmland that bordered the northeastern edge of town. Dorrance, Washington, and Lafayette Streets, opened in 1855 on land owned by John Dorrance and Henry M. Wright, are representative of the expansion of the town that occurred as a result of the prosperity brought by the presence of the canal. The simple frame rowhouses that line Wood and Cedar Streets between Market and Walnut Streets are physical reminders of the workers who labored on the now vanished docks and wharves. Upper class residences constructed during the period of the canal boom are concentrated on Radcliffe Street between Market and Walnut Streets. Significant examples include the two and one-half story stuccoed brick house built in 1831 for Thomas G. Kennedy, the superintendent of the Delaware Division of the Pennsylvania Canal (Radcliffe Street), William Kinsey's c. 1834 three-story Greek Revival style brick townhouse (Radcliffe Street), Kinsey's three-story frame Greek Revival style double house (Radcliffe), and the two fine Greek Revival style frame houses built about 1847 for Charles Peirce and Dr. Augustus Guerard (Radcliffe Street). The prosperity sparked by the canal proved relatively short-lived. The completion of an outlet lock at New Hope in 1840 permitted canal boats to leave the Pennsylvania Canal, cross to the New Jersey side of the Delaware, and enter the Delaware & Raritan Canal. This route greatly shortened the distance required to reach New York and other major northeastern cities and siphoned a great deal of trade away from Bristol. Bristol continued to prosper until about 1855, but the following five years were marked by economic recession. The town did not recover from the loss of its status as a transshipment point until the Civil War (Green 1911:144-48, 173, 241). The economic prosperity that the canal brought to Bristol is manifested in a series of impressive institutional buildings constructed during the 1850s. These include the 1854 Gothic Revival style Masonic Temple located in the 200 block of Cedar Street, Samuel Sloan's 1857 Gothic Revival style St. James Protestant Episcopal Church at the north corner of Walnut and Cedar Streets, and Thomas U. Walter's 1851 brownstone First Baptist Church at the east corner of Walnut and Cedar Streets. Beginning in 1860 the prosperity of Bristol revolved around the community's industrial endeavors. A number of important industrial concerns established themselves along the banks of the Pennsylvania [Delaware] Canal in Bristol during the twenty-five years after 1860, turning the town into the preeminent industrial community in Bucks County. The rolling mills, textile mills, carpet mills, and other industries located along the canal sparked an economic recovery in the community. They generated new wealth, attracted new workers, and are largely responsible for the growth and expansion of the town that occurred in the second half of the nineteenth century. The owners and managers of the mills and factories built a number of magnificent residences, almost all located along Radcliffe Street, in the last decades of the nineteenth century. These include the William H. Grundy House (610 Radcliffe Street), the 1884 Leedom-Pursell House (Radcliffe Street), the John Dorrance House (Radcliffe Street), the 1894 Horace Trumbauer-designed Leopold Landreth House (430 Radcliffe Street), the Frank Bell House (Radcliffe Street), and the c. 1868 Joshua Peirce House (Jefferson Avenue). All of these buildings exemplify the high-style architecture built by Bristol's economic and social elite during the decades after the Civil War. Other significant buildings erected during this period include the 1869 St. Mark's Roman Catholic Church (1033 Radcliffe Street), the 1877 St. James Protestant Episcopal Church Parish House at the east corner of Walnut and Wood Streets, S. A. Brouse's 1894 Bristol High School Building at the north corner of Mulberry and Wood Streets, and the altered 1895 Methodist Episcopal Church at the east corner of Mulberry and Wilson Streets. The new workers attracted to Bristol by the mills and factories required their own housing. Rows of modest worker housing were constructed near the town's industrial district during the decades after the Civil War. The row houses and detached dwellings that line the 200 block of Washington Street are among the best preserved examples of this type of housing in the district. These buildings are the direct descendants of the worker housing constructed in the northern portions of the original town during the canal boom. The community's need for worker housing continued during the first decades of the twentieth century. The residential areas that comprise the northeastern part of the district contain a variety of resources that illustrate the responses to this need. The detached houses that line the 100 block of Jefferson Avenue, almost all constructed between 1911 and 1915, represent the upper limits of worker and middle class housing in the community. The uniform brick rows and slightly more elegant doubles on Lincoln and Grant Streets are typical of the most modest worker housing constructed during the early twentieth century. These buildings largely house recent Italian immigrants who worked in the nearby mills and factories. Twentieth century construction in Bristol, with the exception of the residential areas just described, is largely integrated into the existing nineteenth century streetscape and consists of replacement buildings, or buildings constructed on formerly vacant lots. The 1906 American Hose, Hook & Ladder Company Firehouse at the east corner of Mulberry and Pond Streets is an example of a twentieth century replacement building. The fire company's 1882 brick firehouse formerly existed on the site. The 1927 Bristol Municipal Building, designed by Philadelphia architects Heacock & Hokanson and paid for by local industrialist Joseph R. Grundy, occupies a formerly vacant site at the south corner of Mulberry and Wood Streets. The three commercial buildings that line the southwest side of the 400 block of Mill Street, all constructed between 1913 and 1915, occupy the site of the Bristol Mills. Almost all of the twentieth century buildings located southwest of Jefferson Avenue are commercial or institutional buildings. Most are Colonial Revival in style. The Bristol Historic District encompasses the oldest and most significant portions of the commercial and residential sections of Bristol Borough, the third oldest town in Pennsylvania. The district includes the entire original town of Bristol, as laid out in 1697, and the upper class residential area along Radcliffe Street. Appendages to the district in the area of Washington Street and Jefferson Avenue incorporate significant collections of late nineteenth century and early twentieth century, respectively, worker housing. The district contains a significant collection of residential and commercial architecture dating back to the early eighteenth century. It represents the history of the third oldest town in Pennsylvania, following Chester and Philadelphia, a town once known as the premier spa in the United States, a major transshipment point on the Pennsylvania Canal, and the most important industrial town in Bucks County.